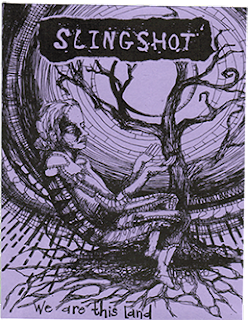 Our book buyer is excited to tell you that Slingshot Organizers are in! 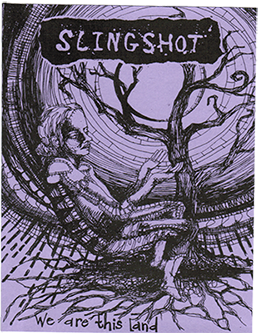 These are a labor of love from the Slingshot Collective in Berkeley and help support the Slingshot newspaper project and indirectly support the Long Haul Infoshop. AND if that weren't enough, when you buy them at SubRosa, you are supporting this local community project too. The pocket version "classic" is a 176 page pocket planner (4.25 inches X 5.5 inches) with radical dates for every day of the year, space to write your phone numbers, a contact list of radical groups around the globe, menstrual calendar, info on police repression, extra note pages, plus much more. Choose from 15 cover colors printed with either black or silver ink. These are 6 bucks. The large-size version is bound with a spiral wire binding and is twice the size of the "classic" pocket organizer (5.5 inches X 8.5 inches) with twice as much space to write all the events in your life. It is 176 pages. It has similar contents to the classic. You get a little bonus stuff in the spiral version. The spiral version is available in 15 colors printed with either black or silver ink. $12 just for you. We've also reorganized the space a bit to give us more space for books and zines. So come in check out SubRosa, and pick up your 2013 Organizer while we still have them.